While researching the history of Edgewood State Hospital, I discovered that there is very little information readily available. Not even Pilgrim State’s own museum has much information – just a couple of pictures. I had researched the Internet thoroughly, and I was only able to find a couple of pictures and a few sentences. 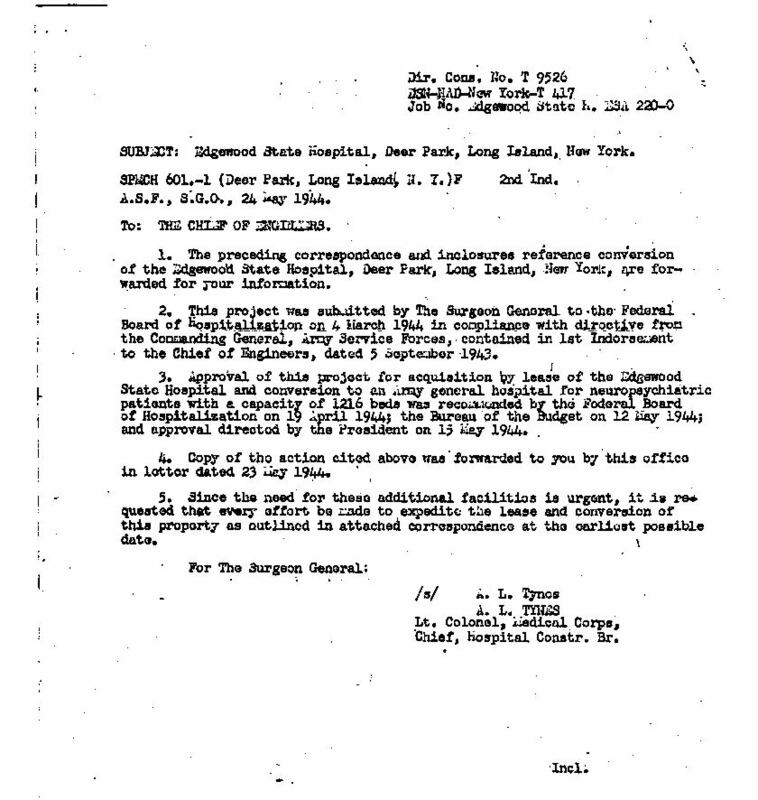 Although there was plenty to be found on Kings Park, Pilgrim, and Central Islip hospitals, there was just not much about Edgewood. I assume this is due to the other 3 complexes still being standing, which makes pictures, and information easier to come by. Edgewood is like the lost, forgotten hospital. My research brought me to libraries, where I dug through Newspaper archives – mostly those of The New York Times and Newsday. I have also checked the Deer Park History books I was able to find, but they led me to the same dead end - they had very little, IF ANY, information on Edgewood. 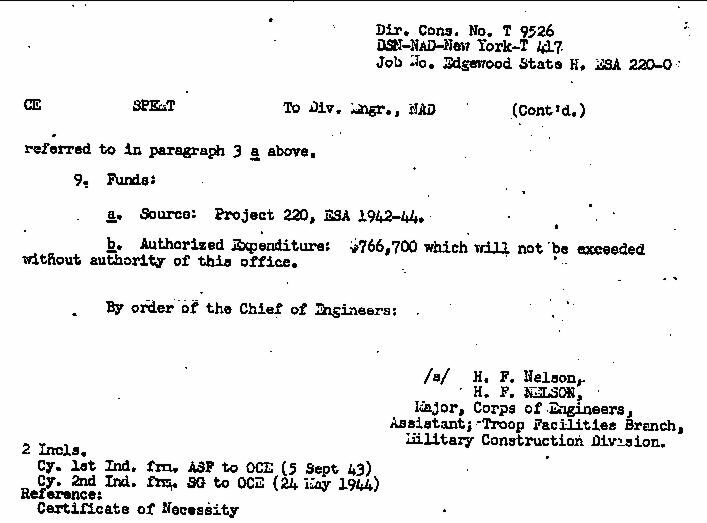 Since my initial research, I have also been in touch with representatives from the Office of Mental Health (OMH), the Office of General Services (OGS), National Archives (NARA), New York Archives, The Museum of New York, the Army Corps of Engineers, and Turner Construction Company. What follows is the History of Edgewood State Hospital, as I have been able to construct based on the information from those sources. Even though I was able to piece together some of the puzzle, I believe there is still a goldmine of information to be discovered. There are gaps in the time line, which will hopefully be filled in with further research and site visitor contributions. Comments, corrections and additions are always welcome. Edgewood State Hospital was built in the early 1940’s, on land adjacent to Pilgrim State Hospital. It was constructed in Deer Park on the east side of Commack Road. In order to accomodate Edgewood, it is believed that the original Commack Road (now referred to as Old Commack Road) was taken out of commission and replaced with Commack Road, as it is known today. The architect of the complex was William E. Haugaard. Haugaard was also responsible for the architecture of several other buildings in NY, including Pilgrim State. (An internet search on his name will show some other samples of his work.) It is believed that Edgewood was originally funded by the WPA(Works Progress Administration), and when the WPA fell out of favor, construction was completed by the US Army. The Army completed construction of the hospital and leased it for use as a POW camp and tuberculosis hospital. 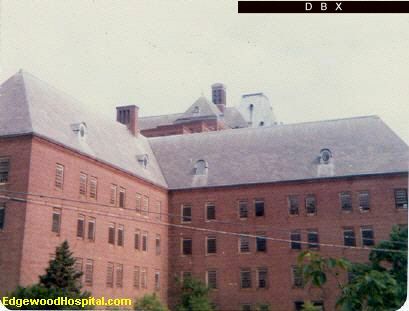 The hospital was also used to help shell-shocked war veterans ease the transition back to “normal lives.” Edgewood State Hospital, along with Pilgrim State buildings 81, 82 and 83, and 60+ other temporary structures (Army constructed) were named Mason General Hospital, while under the supervision of the US Army. The hospital was named after Brig. Gen. Charles Field Mason, who had a distinguished career in the Medical Corps and died in 1922. 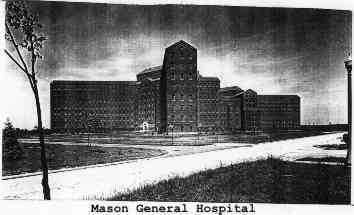 Mason General Hospital was dedicated on June 22, 1944. The last patient left on December 20, 1946 and the hospital was closed (lease terminated) and returned to the State. It is rumored that the first attempt at construction resulted in a building collapsing after it reached the third floor. Documentation of this event has not been found, although one would have to assume that such an event would be mentioned in local newspapers. Can anyone provide documentation of this event? During the Mason General Hospital years, a long-lost documentary was filmed on the grounds of the hospital. The film is titled Let There Be Light, and it is considered one of the greatest films ever made dealing with the impact of war on the human spirit. When Let There Be Light was scheduled for a private showing at the Museum of Modern Art, the army confiscated the film, refusing to allow its release to any civilian audience. It was later determined that the Army simply didn't want the U.S. to see its fighting men as anything other than grinning, self-assured victors. Let There Be Light was not made available to the public until 1980, and then only on the special orders of vice-president Walter Mondale. This film is now in the public domain and can be purchased online. It is odd to see the buildings in such perfect condition, since we are all used to seeing them in their abandoned, vandalized condition. Clips of this documentary can be found in the Video section. Some points of interest: There was a fence around most of the complex, along with gates and sentry houses (guard booths.) Building 155 and the power plant were outside of the fenced area. Also note the Chlorinator House, the traffic circle near the Morgue, the missing chapel, and the original name for 155, "Officers Quarters." There is a significant gap in events here. Can anyone provide information on the hospital during the years following World War II up the days of abandonment in 1969? 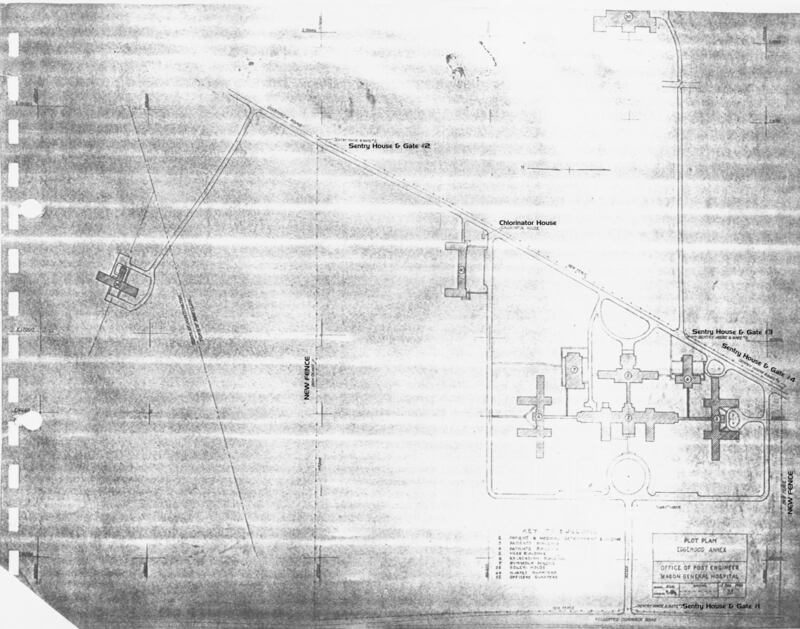 Due to decentralization, improvements in medicine, and the changing beliefs of the mental health system, most of Edgewood State Hospital was closed in 1969, though a few small areas remained open. In 1971, all Edgewood facilities closed their doors for good. Those who explored Edgewood during this time describe the place as being frozen in time - as if the last inhabitants of the building simply ”disappeared” – leaving behind rooms of tools, wire, surgical equipment, patient records, furniture, and other instruments of daily life. After its abandonment, the Hospital remained mostly ignored and undisturbed until the mid-1970’s. In the 80’s, there were huge fires that seemed to burn on an annual basis. These fires took their toll on the Hospital, destroying the trademark French style chateau roof, exposing the metal support pillars. Once the roof was burned away, the main building appeared truly ominous and reeked of neglect and abandonment. The buildings became home to vagrants, vandals, and partying teenagers, while the land became a dumping ground for old tires, stolen cars, mattresses and other garbage. The elaborate underground tunnel system that connected the buildings was also a dangerous, but popular hangout. Edgewood was the scourge of the community for years, and most of the local residents wanted the buildings to be destroyed. Commonly referred to as an “eyesore”, plans were in the making to destroy the complex for over 10 years. Attempts to keep people off the property failed miserably. Even though fences were erected around the complex, people always found a way to get in, by ramming cars through fences or creating entrances with wire cutters. 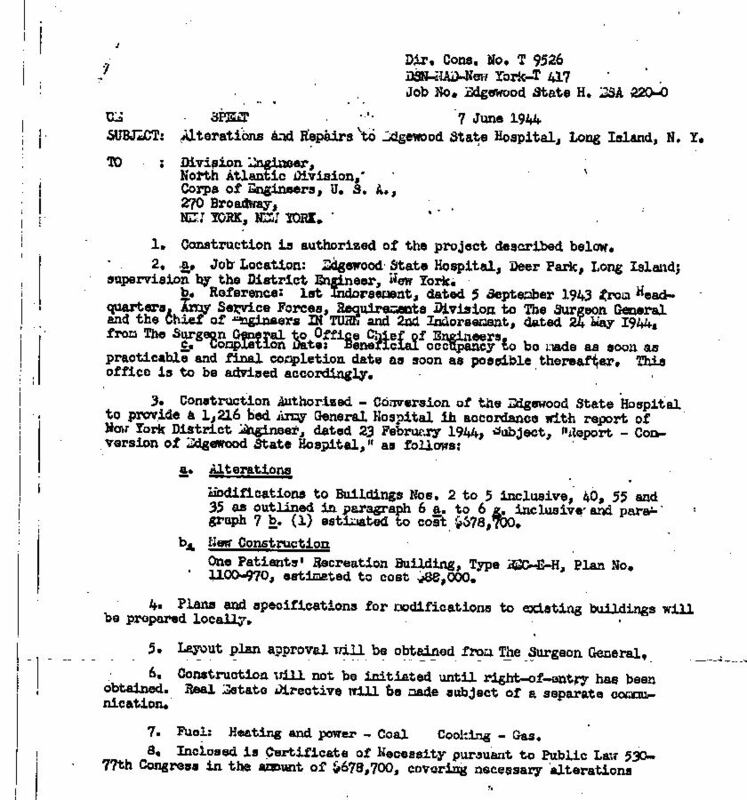 There were several proposals regarding what to do with the land and the buildings – ideas were presented, such as county hospital, college campus, condominiums, industrial park, affordable housing, LIRR super station, court complex, domed stadium/theme park hotel complex, produce market, senior citizen housing, recreational complex, etc. A private developer came up with a final proposal to convert the buildings into condominuims, but it was rejected by the state for political reasons, such as not being allowed to hook into the sewer district, and the Deer Park school district did not want an influx of children in their schools. 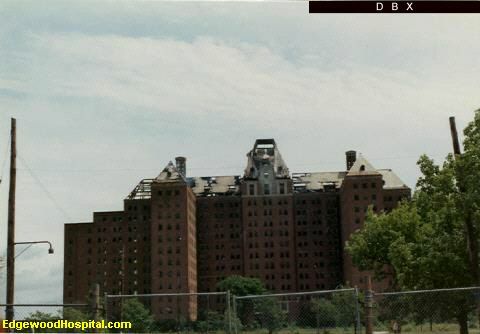 In May of 1988, City Construction Development Inc. of Jersey City bid $4.9 million to demolish the former Deer Park hospital's four main buildings, the first phase of the project. But Edgewood would not go quietly – since it was constructed in the 1940’s, the buildings were laden with dangerous asbestos, which posed a significant health threat if disturbed. Removal of this asbestos was an expensive and slow process. The powerhouse and south wing (building 103) still remained standing, awaiting further funds for their demolition. Even though most of the complex was gone, the property continued to be a popular hangout, with deadly results. In March 1990, a 22 year old man died after falling down a 50 foot shaft, in the abandoned power plant building. It is estimated that the final demolition date was somewhere between 1990 and 1991, for a total cost of $20 million, including all demolition and cleanup. Can anyone produce documentation of these facts? Edgewood Hospital stood on a site long coveted by developers, politicians and urban planners, largely because of its strategic location. It sits in the town of Babylon, and borders on Islip and Huntington, making the site seem ideal for projects or facilities of use to several towns. However, in the end, the land was reverted back to its original function. The former Edgewood Hospital grounds are part of the Oak Brush Plains State Preserve – one of the largest undeveloped areas of any kind west of Brookhaven. The open land where the buildings once stood is now used by radio controlled airplane hobbyists. Although there is very little evidence of the buildings that once stood on these grounds, knowledgeable explorers can still find railroad remnants, tunnel manhole covers, and pieces of brick and twisted steel that once belonged to Edgewood State Hospital. My uncle was a patient at Mason from July 1943 - December 1943, as a member of the U.S. Army. Any information about the facility from that time would be helpful. His military records were destroyed in the National Personnel Records Center in St. Louis in the 70s. Hello, my name is Ignacio, and I am wondering if it is possible to have access to the name of the psychiatrists that work in the hospital. I just recently watch "Let There Be Light" and I want to know if the psychiatrist that appear in the documentary have written any books about hypnosis or anything else. Thanks!!! GOIIN THRUU PILGRIM BUILDINGS IS FUN!!!! In the summer of 1973 some friends of mine found cases of little cans of ether. They were all wasted from sniffing it roaming around the woods in Otsego Park! Just to add to the final numbers, this update comes from a state employee who worked for the Dept. Of Environmental Conservation, said it came to almost $30 million by the time the powerhouse and 103 were demoed in 1991. The first demo contractor went bankrupt on the job and this caused further delays and a rise in costs. So anyone who thinks they can demo Kings Park for a mere $100 million today is DREAMING!!! 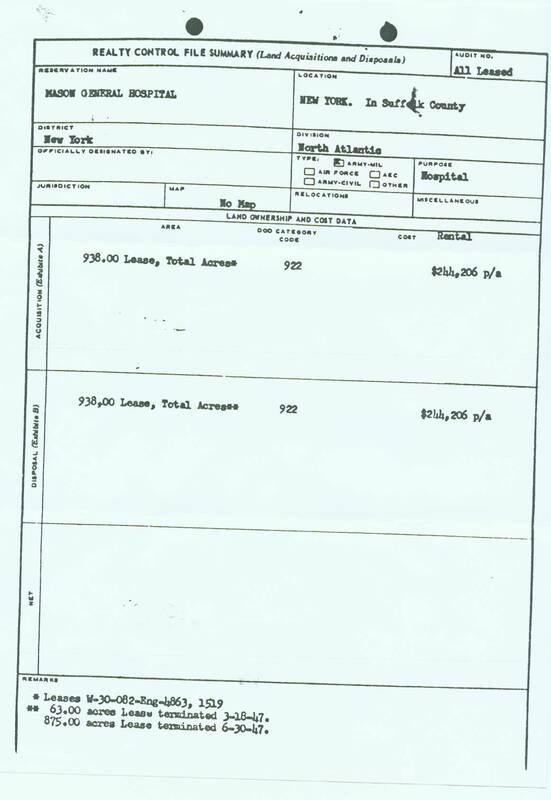 Would have been cheaper to give the buildings and 30 acres to the developer who offered to turn it into condos in 1988. Politics, not the cost of fixing the roofs, is what killed that idea. Welcome, philgg. Good to have you on board. I was in the US Army Medical Corps and was stationed at Mason General Hospital from Oct 1945 to Sep 1946. Several of us (corpsmen) came up to MGH on the LIRR to Brentwood from Ft Dix at about 9PM. The first 3 or 4 days we were bilited at Edgewood, them sent to Mason. I worked on the EST team, in Hydrotherepy on the wards (6SE)and ward administration. The c/o at MGH at that time was Col. Odom. 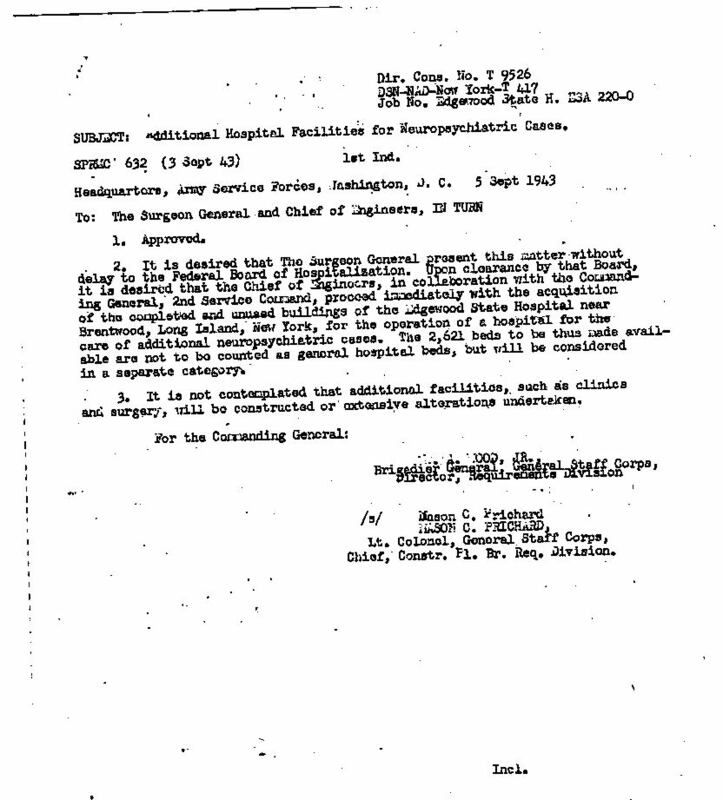 Some of the nurses I remember were Jean Slone (from Brooklyn), Marge Snyder (Peyn Yan) and Alice Sterli (Newton NJ) All Army personnel were removed from Edgewood in Nov 1945. Haverford State Hospital - Is That The One By You? But Not As Cool As Edgewood!!!!!!!!!!!!!!!!!!!!!!!!!!!!!!!!!!!!!!!!!!!!!!!!!!! YEA I USED TO PLAY IN MINE SHAFTS AND CAVES. A MENTAL HOSPITAL SOUNDS SO MUCH MORE FUN. BUT YOU HAVE TO BE CAREFULL THESE PLACES ARE DANGERIOUS. hey yo to all u bros, kill with power, DIE!DIE! hahahaha, i thought all you people were in there,,,,,,now i realize that you all just hung there,,,,we have a place like that in philly called byberry,,same thing happened to that, and its vacant,being halloween today,,,,kids will prob go there and hang out,,,,too scary for me! Between 1979-1982 my crew and I ruled EDGEWOOD. Some of you may remember us. People used to call us the "Birchwood Boys" because of where we lived. I'll mention some name Harry G. Mark L. Dave C. Dominic A. Frank G. Bobby D. Maryann C. and Jerry G.. We stole copper from the crown for beer money and we had wild parties on the ledges. I have been in the tunnels many times and have been chased by security more times that I can count. I also remmember Abdul. Harry G. and myself one night made to the crown with two bic lighter. It was very freaky. How are you?...Long time, no speak. Any chance of you getting the clip from Let There Be Light up on the videos section? The second or two when they show the soldiers on the front lawn with the monsterous buildings in the background; (even a screen-grab would be cool). I think eveyone would dig seeing the building as it appears in that film. hmm, Joey G --- were you friend with Eric M back in the day? Lived a few houses down from you? a doobie snack to christen me in, i was 15 at the time. Edgewwod memories will always be instilled into my warped brain,lol. Later People.. Dooshbag Out! I see some names i recognize here! I know ive been to Edgewood with a few of them..Arch...Aup....Here is a hint... I hung out with Ron and my brother was James.. If it was, and it very well may have been so, then you have a better memory then me my friend. God Bless. iownit, did you drive my 71 dodge up in walton? iownit, i know who you are. Hello there. As a early to mid 80 s "Edgewood Vetran" lol,I could ramble on and on about stories on edgewood, but Ill wait till the stories section is up. Hehe.. I even work on the grounds too!!! I cant get away from the spirit vortex! In the meantime, Cheers and Happy Holidays from the front line.